Bend Oregon is a dog-friendly city, so much so that most places allow you to bring your dog inside and they have even established several off-leash dog parks in the area. Many locals and vacationers are looking for places to take their pups in Bend. After all, they are man’s best friend, and who wouldn’t want to take their best friend on a little date around town. So go ahead and have some play time in the park, take a walk downtown or a hike through the mountains, or cool off in the Deschutes River. 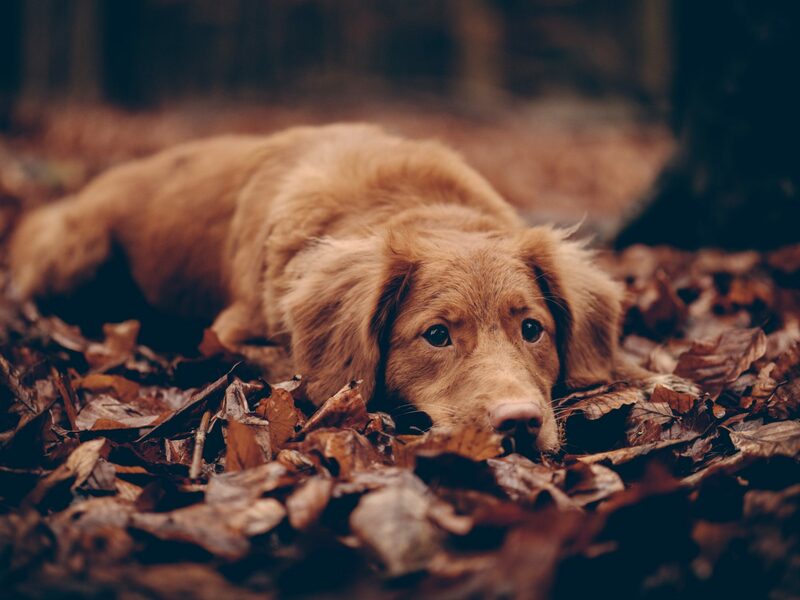 However you wish to spend your day with your dog, you are sure to find pet friendly accommodations suitable for you and your dog, fitting your personalities and lifestyles. There are eight off-leash dog parks/areas in Bend that allow your pup free roam and play with other dogs. Here you will find a complete list with details of what to expect at each park. This large park area gives plenty of room to run and roughhouse with your pooch. It is important to note, however, that the entire area is unfenced so it may not be appropriate for all dogs. It is recommended that only dogs who possess a good recall be brought to this park as wandering off may be possible. The park is connected to a variety of trails so there is more area for you and your dog to explore together outside of the open play area. Because this large area of land is not fenced, there aren’t many amenities available to the visitor. You will need to remember your own water, dog dishes, and poop bags – a necessity for visiting an off-leash dog park. This is a very popular park in Bend for dogs. It is also popular for the sports fanatic as there are 4 regulation soccer fields, a baseball field, a softball field, and a BMX track. There are two areas in this park for dogs, one unfenced area for on-leash play and a fenced area for off-leash dogs. The park’s off-leash area is vast, including trails to explore together. You can also find a water spigot to refresh your pup and a portable toilet for yourself. You can also enjoy lunch at one of the picnic tables available in the off-leash area. This is one of the largest parks you will find in Bend as well as the largest off-leash area open to dogs. Pine Nursery Park is a large community park in northeast Bend with 14 acres of fenced off-leash area for dogs. Take your pup on a walk through the Pine Nursery Park Trail, a fully paved, wide trail (1.3 miles) that circles the perimeter of the park and dissects through the middle. It’s suitable for running and biking as well as walking thanks to its relatively even terrain. This is one of the few parks that has a designated small dog area, in case your little pooch doesn’t do so well with those that aren’t their size. There is also a seasonal splash pad where your dog can cool off during the summer. You will also find fishing ponds, a disc golf course, and an all-abilities playground available for kids. Located within the NorthWest Crossing neighborhood, Discovery Park is a great place for dogs and humans alike, with about 12 acres of developed park and 20 acres of open space surrounding a 3-acre lake. Within this developed space is a small fenced area that is designated for off-leash play for dogs. There are also walking trails, restrooms, and picnicking areas. Please note that the lake is for irrigation purposes only. It is not treated, so swimming and water play are highly discouraged – do so at your own risk. Fishing is not allowed either. There’s more to this park than open space; it was once the home of a working ranch and still retains much of its pioneer charm to this day. On site you can still find several of the original buildings, including the renovated Hollinshead Barn which can be reserved for special occasions. In addition to the history and charm you will find here, you can also expect a sense of family in the community, where people get to know each other regardless of whether they are locals or just visiting. There is picnic space, open fields and orchards, and a sizable, fenced off-leash area for your dog to run free. This is an area that gets very little attention from those who aren’t looking for it. Overturf Butte is located right in the center of Bend’s west side and gives you access to several trails that snack their way up the 3,881-foot butte. The fenced off-leash dog area is located adjacent to the reservoir property near Skyliner Summit Loop, making it very easy to find. It is partially fenced, so it is especially important that you keep an eye on your dog at all times. Complimentary poop bags are available on site, but you will need to bring your own water bottles and dog dishes. You will also find Overturf Park nearby, which provides access to the Cascade Highlands. This is a great place for the whole family with a horseshoe pit and playground. This park is located in an older neighborhood near Bear Creek grade school. As such, it is home to many adult softball and youth soccer games during the spring, summer, and autumn. Here you can also find a skatepark, pickleball and basketball courts, and playground for kids and adults alike. The off-leash dog park itself is 2.9 acres fenced with a separate small dog area. 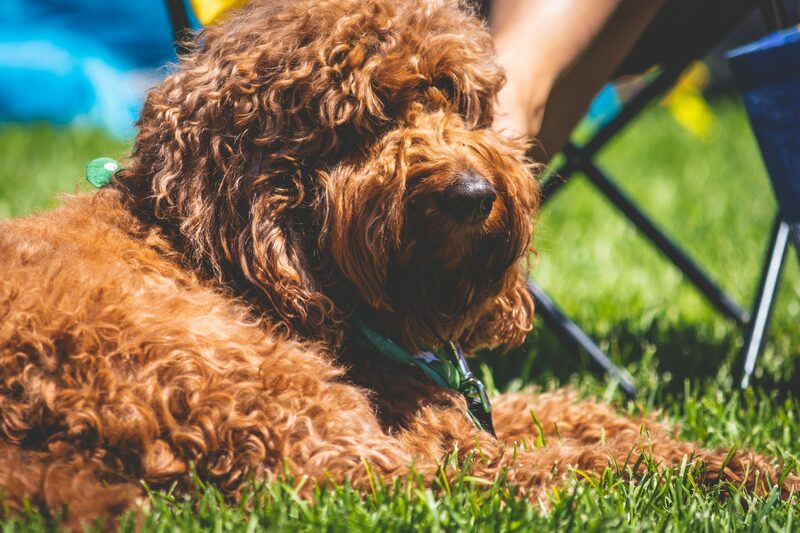 From the park, you have access to walking trails that allow you and your pooch to stretch your legs and a picnic area to relax with a bite to eat. Near the Old Mill District in Bend, you will find Riverbend Park located along the Deschutes River, making it a great play for you and your pup to play on a warm summer’s day. It is one of the few areas that has access to the river year round. It is a very popular location for water sports like river floating, paddle boarding, and kayaking. It is also one of the few locations that allows for water play with your dog off leash. Its central location gives you easy access to a number of trails as well as other parks like McKay, Bend Whitewater, and Drake with its scenic Mirror Pond. Sometimes big dog play is not suitable for little dogs. They can be trampled or simply feel like they can’t keep up with their little legs. In these cases – if you have a small dog that may play better with dogs their own size – there are a few fenced small dog parks around Bend. You can currently find these areas at Riverbend, Pine Nursery (Bob Wenger Memorial Off-Leash Area), and Ponderosa Parks. In order to be considered a small dog appropriate for these areas, they must be less than 15 inches at the shoulder and under 25 pounds. For more information, email or call the Bend Parks and Recreation Department. One of the few off-leash areas outside of Bend Oregon (still nearby) is the Weigand Family Dog Park in Redmond – located within Redmond’s Dry Canyon. The project was started in 2008 when dog park advocates and city officials agreed on a need for one, and the park was completed in 2011. It is a large fenced area with separate sections for large and small dogs. Just like with any other dog park, you are fully responsible for your dog, including their behavior and anything they may leave behind. Park officials kindly ask that you keep your dog from digging holes in the park as well. Sponsored by Ruffwear – the dog sportwear outfitters in Bend – this dog park is located on the Mt. Bachelor resort near the West Village parking area. It is the ONLY off leash area of the resort, but it’s a great place for your pup to burn off some energy and enjoy playing the snow. Not only is the area always well-groomed but there are toys provided for your pup to play with, so you don’t need to worry about packing anything extra. They also provide waste bags to help you clean up after your dog. 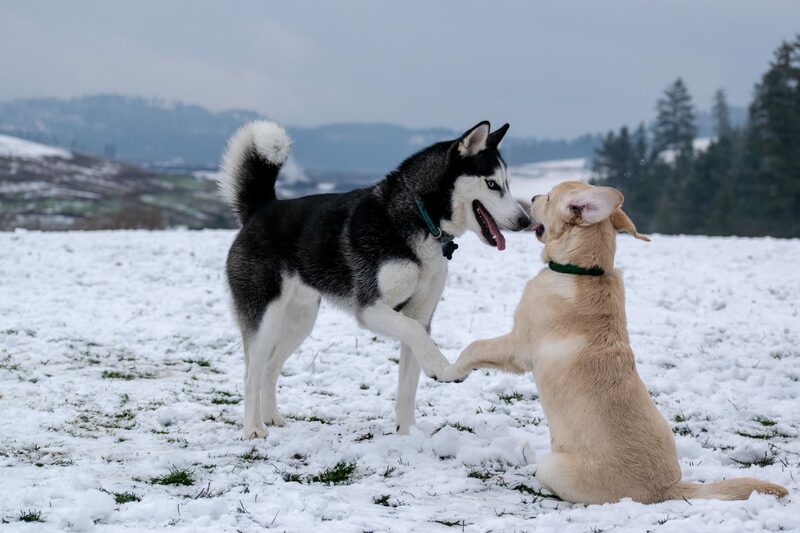 This dog park is only open during the winter as the mountain’s wildlife is heavily protected during the summer months. You will need to stick to the approved dog-friendly trails during the warmer months and keep your pup on leash. Outside of these designated parks and areas, dogs are supposed to be leashed at all times until you are within the confines of the off-leash areas. Be sure you always follow the rules and regulations within the off-leash areas which cover both the conduct and condition of your pup. You need to come prepared to show your dog’s tags with proof of their current license and vaccinations. You cannot bring a puppy without a complete cycle of vaccinations completed. Dogs in heat or those who may be exhibiting aggressive behavior are not allowed either. 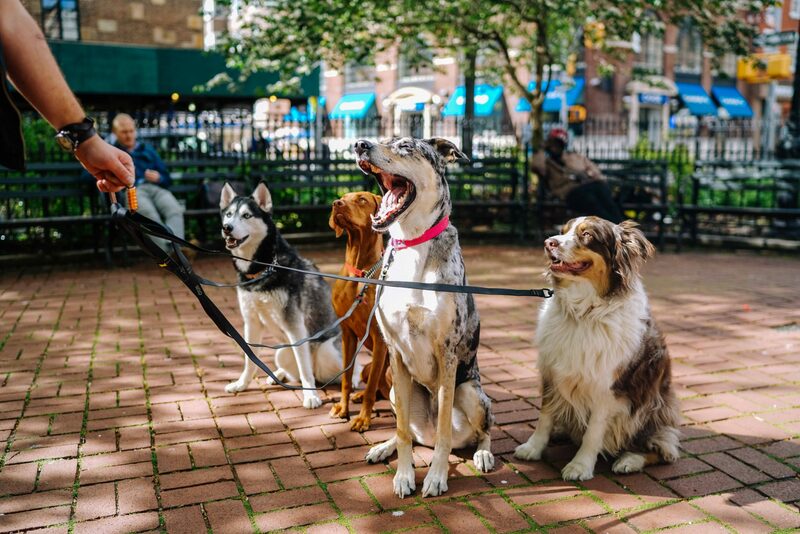 Always carry a leash for each dog within your care – no more than 3 allowed per person – and remain within calling distance. Be sure to clean up after your pup as well. If you notice any inappropriate behavior, remove your dog from the premises immediately. Failure to abide by these rules can get you both ejected from the park and facing a possible hefty fine ($330 for first-time offenders). Make it an enjoyable visit for you and your pup so you can visit over and over again in the future. Bend is known as one of the most dog-friendly cities in the US, so there are tons of activities for you to enjoy with your four-legged bestie. From water sports to winter play, hiking, biking, exploring, and eating, you are bound to find something for the both of you to enjoy. Looking for some suggestions? Check out our list of dog-approved activities in Bend. You can actually find a brew made specially for dogs right in Bend. Known as the Dawg Grog, this brew combines the art of craft brewing with health and nutrition in mind for dogs. With brewer’s wort as its base, you still have the heart of a beer without the harmful side effects hops have on dogs. This dog-friendly drink is both 100% vegetarian and healthy for your pup. If water sports is what you’re after, then you definitely need to check out Ruffwear. 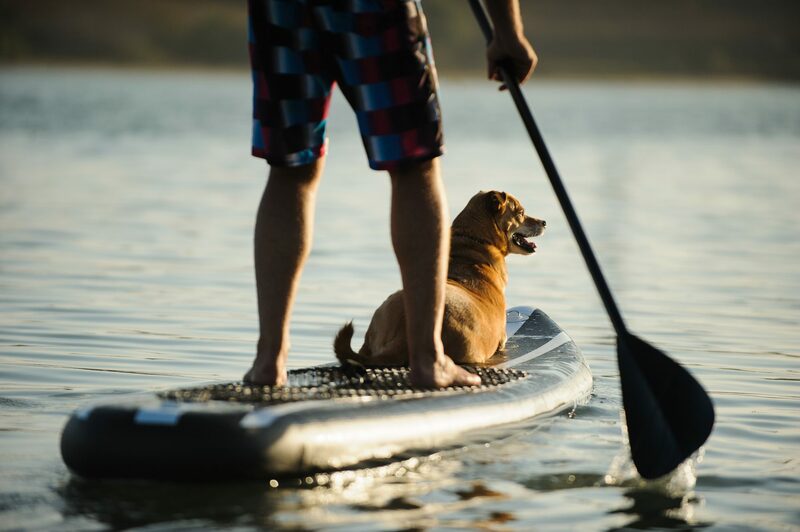 They have everything available to make time on the water with your pup possible. They can even outfit your dog with a life jacket and prep them for paddle boarding, kayaking, white water rafting, and so much more. There are several dog-friendly trails around Bend that allow you to take your pup along. Some even allow for a bit of exploring off-leash. Try the Deschutes River trail for some play time in the water during the summer, or Wanoga Trail for some play time on the groomed snowy grounds. Enjoy a scenic chair lift ride up Mt. Bachelor. On your way up, you can check out the pet friendly Pine Marten chairlift during the summer. It’s equipped with a full body harness to ensure your pooch has a safe ride up the mountain. Keep in mind to stick to the approved trails for dogs and know that there is no off-leash area available during the summer time as the mountain is a wildlife protected area. Humans aren’t the only ones in need of some TLC every once in a while. Let Fido relax at one of Bend’s dog spas. Sometimes they need a haircut or a manicure; sometimes they may even need a break from their human. In Bend, you can find some great salons that offer professional service or allow you to wash your own dog while providing the supplies you need. You can also find some great doggie daycare facilities, like Kindred Spirit, who offer cage-free boarding and care, allowing your dog to roam free and socialize with other pups. Take a trip up to Mt. Bachelor to check out the Ruffwear off-leash dog park. It’s the only off-leash area at the resort wear your pup can run freely and play. You can also find a few snowy trails that are dog-friendly. Wanoga trail is the only one that is groomed, but you can also find Edison sno-park or Skyliner for lower elevation options (these aren’t groomed). All mountain bike trails in Bend are dog-friendly. 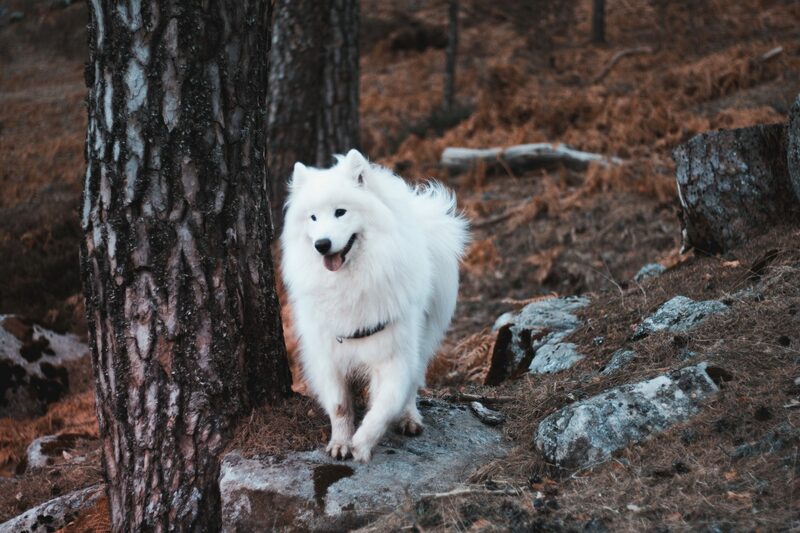 You can have fun ripping up the trails while your pooch runs to keep up, giving you both some much-needed outdoors time and exercise together. Of course, you do need to be in full control of your dog while you are on the trails even when they are off-leash. Stay within call distance of your dog and keep an eye out for other bikers and hikers. Central Oregon has many beautiful places worth noting and visiting on your trip, a few of which are very close to Bend. 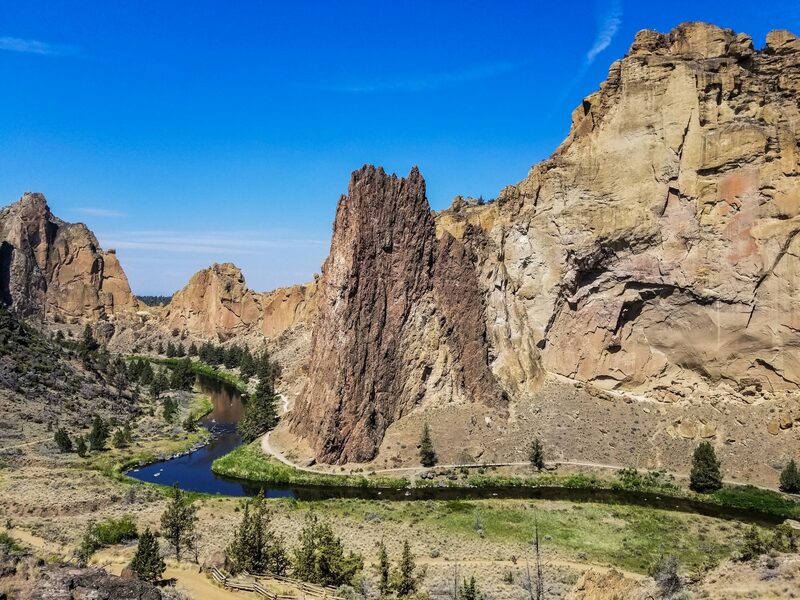 Smith Rock State Park is known to be a climber’s paradise, but it’s also a great place to go mountain biking with your pooch. Just be careful to keep an eye out for wildlife as eagles and mountain lions do roam the grounds. Named for the colorful layers of red, yellow, and black, the Painted Hills’ open landscape will have you feeling like you’re walking on Mars. Crater Lake is another great location for a hike with your pup, but only in certain areas. The best area is Rim Village, where you and your dog can take a ¼-mile walk on paved roads with an excellent view of the lake. So many eating establishments – restaurants and breweries – in Bend are dog-friendly. You can enjoy a bite to eat or a local brew with your faithful companion at your side the whole time. Check out 10 Barrel or Cascade Lakes Brewing Co. for a great drink and spacious patio seating for your pup. Everyone loves the festivities and spirit of a good Oktoberfest celebration, and what better place to enjoy some good local brews than Bend? Not only do they have good beer available, but they also have their ever-popular wiener dog races. 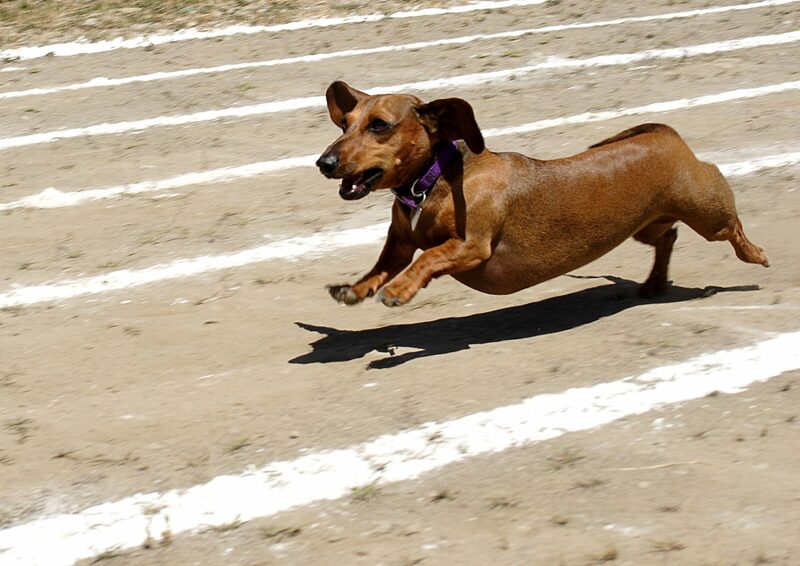 You can register your dachshund on site (if you have one you want to race) or you can simply bring your non-wiener pooch to enjoy watching the race. At one of Bend’s great pet stores you will find everything you could possibly need for your pooch. In the heart of downtown, after a stroll through all of the human stores, you can stop in one of the many pet stores found in Bend. Mud Bay is definitely worth noting. It’s Bend’s local natural pet food store. You can always count on quality in their treats, foods, and toys. Get adventurous and try Skijoring on the Nordic ski trails. If you haven’t tried Skijoring, you will definitely want to during your next winter trip to Bend with your pup. This winter sport combines Nordic (XC) skiing with the power of your pooch, giving you the classic dog sled experience on skis. Enjoy some tunes at the dog friendly free Summer Sunday Concerts in Bend. For 15 years, the Les Schwab Amphitheater (LSA) has been offering free outdoor concerts in the Old Mill District of Bend. You can find local bands and foods every Sunday in summer from Memorial Day through August. They did announce in 2018 that they plan to take an indefinite break, but they do have plans to reinstate these concerts in the future. Everyone needs a good way to cool off after a long hike during the summer. At Riverbend Park, you won’t only find an off-leash area for your dog to run free but your pooch can also have fun swimming and playing in the water when you get back from the trails.